The Boston Red Sox are dealing with a nasty World Series hangover thus far in 2019, falling to the bottom of the American League East and owning the second-worst record in the league at 6-12, and the New York Yankees are taking full advantage of it. New York received a hit from everyone in their injury-depleted lineup on Tuesday and cruised past Chris Sale and the Red Sox 8-0 in the opener of a brief two-game set in the Bronx. The Yankees got a three-run homer from Mike Tauchman and solo shots by Clint Frazier and Gleyber Torres in the triumph, as Tauchman’s blast was his first in 61 career games, while also adding a run-scoring double. Boston managed just three hits in the contest and have seven total in the last two games, losing by a combined 16-1. Shortstop Xander Bogaerts had one of Boston’s hits and has hit safely in seven of the past eight games, while DH Steve Pearce went hitless in four at-bats Tuesday to drop his average to .100 (2-for-20) on the season. While last night’s pitching matchup was supposed to be a duel, Wednesday’s could be a slugfest as Boston’s Nathan Eovaldi and New York’s J.A. Happ have been rocked so far in 2019. Eovaldi is looking for his first decision of 2019 after being hit hard in his first three starts, despite Boston winning each of those outings. Eovaldi has pitched exactly five innings in his first three turns, allowing six home runs already and has a 1.87 WHIP. He allowed five runs and four walks in his latest outing against Toronto, and was 1-1 with a 1.93 ERA in four starts versus the Yankees in 2018, then beat them in the playoffs. Happ has looked just as bad if not worse than Eovaldi, as he’s failed to complete five innings in any of his three starts including looking bad in both outings against the lowly Baltimore Orioles. His worst outing came last time out when the White Sox hit him for six runs and nine hits in four innings of work and has surrendered a home run in his last six starts dating back to last year. Happ had success against Boston in 2018, going 1-1 with a 1.99 ERA in four starts. The OVER is 5-1 in the last six regular season meetings between New York and Boston. These two pitchers are really struggling right now, and even though Boston’s offense has just seven hits in their last two games, are capable of breaking out anytime. That time is tonight against a struggling Happ. New York proved last night that it doesn’t matter who they put in the lineup – they will always find a way to score runs. I like the over in this one. Check out who Bobby Babowski has for Wednesday on his Free MLB Picks page. He is 33-22 +685 Units on the season after a perfect 2-0 Tuesday. Red Sox are 4-1 in their last 5 after allowing 5 runs or more in their previous game. Red Sox are 38-13 in their last 51 road games vs. a team with a losing home record. Red Sox are 37-14 in their last 51 road games vs. a team with a losing record. Red Sox are 10-4 in their last 14 after scoring 2 runs or less in their previous game. Red Sox are 49-20 in their last 69 vs. a team with a losing record. Red Sox are 60-26 in their last 86 games vs. a starter with a WHIP greater than 1.30. Red Sox are 9-4 in their last 13 games vs. a left-handed starter. Red Sox are 36-16 in their last 52 Wednesday games. Red Sox are 54-26 in their last 80 when their opponent scores 5 runs or more in their previous game. Red Sox are 58-28 in their last 86 vs. American League East. Red Sox are 5-11 in their last 16 overall. Red Sox are 5-11 in their last 16 games on grass. Red Sox are 1-4 in their last 5 road games vs. a left-handed starter. Red Sox are 2-8 in their last 10 road games. Red Sox are 5-0 in Eovaldi’s last 5 starts. Red Sox are 5-0 in Eovaldi’s last 5 starts on grass. Red Sox are 4-0 in Eovaldi’s last 4 starts when their opponent scores 5 runs or more in their previous game. Red Sox are 4-0 in Eovaldi’s last 4 starts after allowing 5 runs or more in their previous game. Red Sox are 4-1 in Eovaldi’s last 5 starts vs. a team with a losing record. Yankees are 4-0 in their last 4 vs. American League East. Yankees are 5-2 in their last 7 when their opponent allows 5 runs or more in their previous game. Yankees are 12-5 in their last 17 during game 2 of a series. Yankees are 57-26 in their last 83 home games vs. a team with a road winning % of less than .400. Yankees are 51-25 in their last 76 home games vs. a right-handed starter. Yankees are 2-5 in their last 7 overall. Yankees are 2-5 in their last 7 games on grass. Yankees are 9-24 in their last 33 after allowing 2 runs or less in their previous game. Yankees are 2-7 in their last 9 games following a win. Yankees are 1-4 in their last 5 games vs. a right-handed starter. Yankees are 1-4 in their last 5 games vs. a starter with a WHIP greater than 1.30. Yankees are 1-6 in their last 7 when their opponent scores 2 runs or less in their previous game. Yankees are 7-2 in Happ’s last 9 starts after scoring 5 runs or more in their previous game. Yankees are 6-2 in Happ’s last 8 starts when their opponent allows 5 runs or more in their previous game. Under is 4-0 in Red Sox last 4 road games vs. a team with a losing home record. Over is 10-2 in Red Sox last 12 Wednesday games. Over is 10-2 in Red Sox last 12 when their opponent allows 2 runs or less in their previous game. Under is 4-1 in Red Sox last 5 overall. Under is 4-1 in Red Sox last 5 vs. a team with a losing record. Under is 4-1 in Red Sox last 5 on grass. Under is 4-1-1 in Red Sox last 6 when their opponent scores 5 runs or more in their previous game. Under is 4-1 in Red Sox last 5 games vs. a starter with a WHIP greater than 1.30. Under is 4-1 in Red Sox last 5 vs. American League East. Under is 4-1-1 in Red Sox last 6 after allowing 5 runs or more in their previous game. Over is 4-1 in Red Sox last 5 road games vs. a left-handed starter. Under is 4-1 in Red Sox last 5 road games vs. a team with a losing record. Over is 7-2 in Red Sox last 9 after scoring 2 runs or less in their previous game. Under is 3-1-1 in Red Sox last 5 games following a loss. Over is 3-1-1 in Red Sox last 5 during game 2 of a series. Over is 6-0-1 in Eovaldi’s last 7 starts on grass. Over is 5-0 in Eovaldi’s last 5 starts after scoring 2 runs or less in their previous game. Over is 4-0 in Eovaldi’s last 4 road starts. Over is 6-0-1 in Eovaldi’s last 7 starts overall. Over is 5-0 in Eovaldi’s last 5 starts when their opponent allows 2 runs or less in their previous game. Over is 8-0-1 in Eovaldi’s last 9 starts after allowing 5 runs or more in their previous game. Over is 3-0-1 in Eovaldi’s last 4 starts vs. American League East. Over is 7-0-2 in Eovaldi’s last 9 starts when their opponent scores 5 runs or more in their previous game. Over is 4-1-1 in Eovaldi’s last 6 starts during game 2 of a series. Under is 6-1 in Yankees last 7 home games. Over is 4-1 in Yankees last 5 Wednesday games. Over is 4-1 in Yankees last 5 vs. American League East. Under is 4-1 in Yankees last 5 games vs. a team with a winning % below .400. Over is 11-3 in Yankees last 14 after allowing 2 runs or less in their previous game. Over is 10-3 in Yankees last 13 games vs. a starter with a WHIP greater than 1.30. 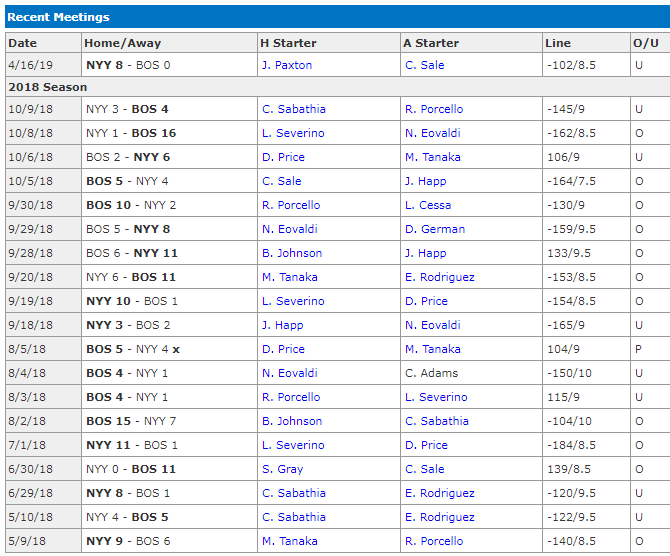 Over is 12-4 in Yankees last 16 when their opponent allows 5 runs or more in their previous game. Over is 6-2 in Yankees last 8 games vs. a right-handed starter. Over is 14-5 in Yankees last 19 games following a win. Over is 10-4 in Yankees last 14 after scoring 5 runs or more in their previous game. Over is 22-9-1 in Yankees last 32 home games vs. a team with a road winning % of less than .400. Over is 7-0-1 in Happ’s last 8 starts when their opponent allows 5 runs or more in their previous game. Over is 6-0 in Happ’s last 6 starts on grass. Over is 7-0-1 in Happ’s last 8 starts vs. a team with a losing record. Over is 5-0-1 in Happ’s last 6 home starts vs. a team with a losing record. Over is 6-0 in Happ’s last 6 starts overall. Over is 5-0 in Happ’s last 5 starts vs. American League East. Over is 6-0 in Happ’s last 6 starts after scoring 5 runs or more in their previous game. Over is 5-1 in Happ’s last 6 home starts. Over is 4-1 in Happ’s last 5 starts with 4 days of rest.